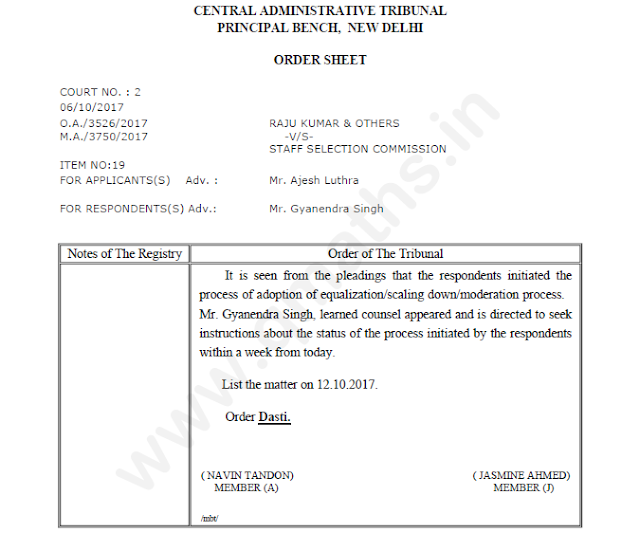 CENTRAL ADMINISTRATIVE TRIBUNAL (CAT) has initiated the case regarding SSC CGL 2016 Tier-1 Normalization. Below is the Order of CAT. It is seen from the pleadings that the respondents initiated the process of adoption of equalization/scaling down/moderation process. Mr. Gyanendra Singh, learned counsel appeared and is directed to seek instructions about the status of the process initiated by the respondents within a week from today. List the matter on 12.10.2017.